I’m not one for buying the food magazines at the checkout in supermarkets, my wife on the other hand is! She loves those glossy magazines and quite often we do find a recipe or two to try and in this case, this is where I found this recipe! In German this recipe is called a “Mediterrane Nudelpfanne” which is basically a Mediterranean Noodle Pan! 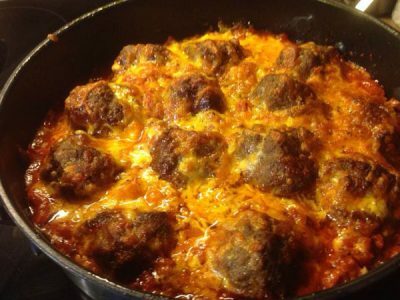 The poor meatballs and cheese don’t even get a mention and the fact that it uses Cheddar kind of takes away the Mediterranean bit, so that’s why I’ve adapted a new name for this dish. It seems anything with tomato and basil falls under the “Mediterrane” category and the “Nudelpfanne” bit comes from the fact that the recipe uses Orzo, the Greek rice shaped pasta and it is cooked in a pan! Anyway, we were looking for something new to cook on a Sunday and this was the choice of my wife. I wanted to cook one of my old favourites Chicken rice casserole. But the family ganged up on me and therefore it was the Cheesy Baked Meatballs that won! It is in fact a seriously calorific, but tasty dish though! Heat up a pan that can be used in the oven and add a tablespoon of the olive oil, then add the onion. Fry for a few minutes until golden then add the garlic and fry until glazed then remove from the heat and let it cool down. My family don’t like onion so I used powdered for the flavour only. I’m sure using the real deal the texture of the meatballs will be awesome! In a large bowl mix the minced beef with the bread crumbs, egg and some of the cheddar a good pinch of thyme and the same of oregano and when cool, the onion and garlic, but don’t wash the pan. Mix well and season with salt and pepper. Now take the meat mix and roll into nice sized meatballs, try and get 20, that would be enough. In the pan add the remaining oil and brown the meatballs. You don’t need to cook them through as they will be going in the oven. Remove the meatballs when browned and place to one side. Preheat oven to 180°c if electric, 160° if fan assisted or gas. Crumble the Oxo cube or if you have a stock pot add this to a 500ml of hot water to dissolve a bit. Now stir in the tomato paste into the water too. Pour any oil from the pan as you don’t want this to be to oily, but don’t wipe the pan out. Now in the pan pour in the tin of tomatoes and the stock with tomato paste and give a good stir and a pinch of thyme and oregano, a good pinch of salt and black pepper to taste. Stir in the kritharaki or orzo, whichever you like to call it, then add the meatballs, pressing them into the liquid. Bake in the oven for about 10 minutes or until they are looking good and the sauce is bubbling away nicely as you want to cook the pasta. Remove from oven and sprinkle with the rest of the cheddar. Add more if you think it necessary, then put heat up to 230°c electric, 210°c for fan assisted or gas and put the pan back in the oven for another 10 or so minutes or when the cheese is bubbling away. You can always pop under the grill for a couple of minutes to brown if needed. Whilst the pan is in the oven halve you bread then slice length ways giving you 4 nice big slices. Pop in the toaster or under the grill. When the meatballs are ready remove and let sit for a few minutes. This is a good time to add the garlic butter to the bread and give another few minutes under the grill to toast the butter in. Wash the basil and then chiffonade it. Serve in nice deep plates or bowls, sprinkle the chiffonaded basil over add the garlic Parisien and Enjoy!